Obama has a laugh on "Jimmy Kimmel Live"
LOS ANGELES -- President Obama read "Mean Tweets" on ABC's "Jimmy Kimmel Live" Thursday night, but he was unfazed. 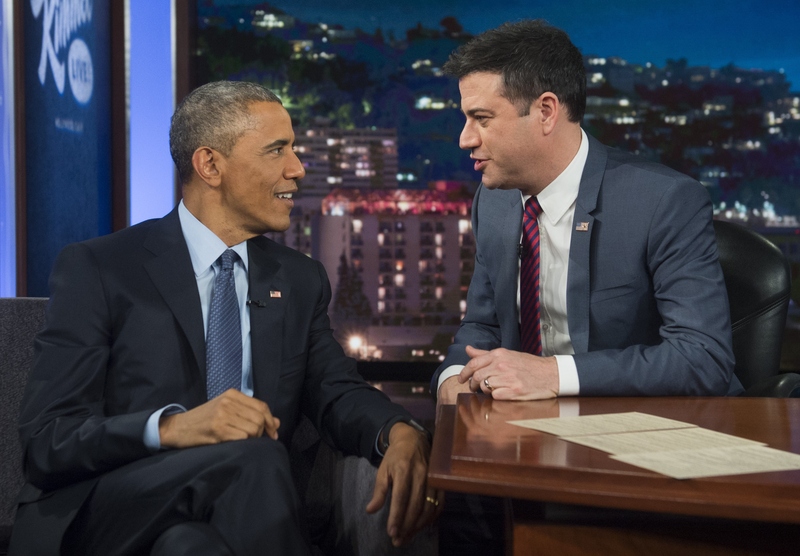 After enduring the routine -- in which celebrities read hostile Twitter comments about themselves -- Mr. Obama told Kimmel, "You should see what the Senate says about me." Obama: "I know where my birth certificate is, but a lot of people don't"
Mr. Obama -- whom Kimmel introduced as the "first Kenyan-born Muslim Socialist ever elected president" -- deadpanned that Kenyans "drive on the other side" of the road. With Sean Penn waiting in the wings, Mr. Obama said he was quite familiar with Penn's 1982 coming-of-age comedy "Fast Times at Ridgemont High." "I lived it," Mr. Obama said. "I didn't just see it." Kimmel spared the president from questions about the latest controversy involving the Secret Service -- although Kimmel's security guard and sidekick, Guillermo Rodriguez, dressed in a full Secret Service getup of dark suit and sunglasses. The glasses, Kimmel joked, were simply hiding a hangover: "Secret cerveza." Mr. Obama's appearance on "Jimmy Kimmel Live" fulfilled a commitment the White House made after he had to postpone an appearance last year. During a more subdued segment, Mr. Obama reflected on Wednesday night's shooting of two police officers in racially tense Ferguson, Missouri, just days after he had delivered a speech on racial healing in Selma, Alabama. "Whoever fired those shots should not detract from the issue -- they are criminals, they need to be arrested. And then what we need to do is make sure that like-minded, good-spirited people on both sides -- law enforcement, who have a terrifically tough job, and people who understandably don't want to be stopped and harassed just because of their race -- that they are able to work together to come up with some good answers." After the "Kimmel" taping, Mr. Obama attended a Democratic National Committee fundraiser at the Santa Monica home of Chris Silbermann, president of ICM Partners, one of the top talent agencies in Hollywood. The event was closed to the press, but a Democratic official said the event attracted about 25 people who each paid up to $33,400. On Friday, President Obama is flying to Phoenix to hold a roundtable event on veterans' health care.